"​If you are looking for a bird to be a part of your family, this is the place! I can’t even imagine the amount of effort it must take to hand-feed a baby bird. However, Karen goes so far beyond that! Her birds are handled often, raised among other birds, children and dogs, exposed to everyday household noises and raised to be comfortable with a variety of foods, showers and flight harnesses. Most of all, Karen's birds are raised with LOVE. It shows in the way she cares for them, the way she talks about them, the way she shares information with others and the way she follows up on their well-being after they have left her home. 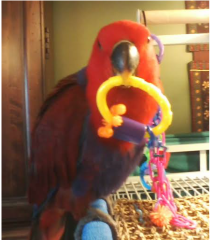 When we came home with our eclectus, Piper, we were expecting a long adjustment period. We anticipated moving slow to gain Piper’s trust. However, Piper wasn’t interested in going slow. She was curious and very interested in being close to us. She was immediately comfortable with our children and dog. She comes to her cage door eager to be with us and really seems to enjoy being part of our family activity. I couldn’t have asked for a more well-adjusted bird. I just don’t think she would be so easy if she hadn’t had such a great start to her life!" 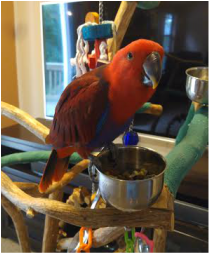 "As the parent of a new Red-sided Eclectus baby girl from Whimsical Wings, I can't say enough good things about Karen and her birds! From the moment we picked up our baby, it was apparent that Karen had provided the individual attention she needed to be a well adjusted, friendly and confident member of our family. Our baby, Gemma, is so very friendly, eats a great variety of foods, and will go to anyone! Having been socialized in a busy family setting, she's even good with children. She's definitely a joy! As a bird lover who has owned birds for many years, I can honestly say that it is rare to find a breeder like Karen. She's one in a million, and we would definitely buy from her again." Karen, just a note to thank you for everything you've done for me - Willow is doing great, and she's GORGEOUS! To begin with a baby that has started life with love, affection and confidence is an absolute benefit to bird and I who have the pleasure of their company. About a month after I had Willow I asked my daughter Chloe - Do you think she's bonded to me? Her response was - I think she came ready to love. Thanks again. She is incredibly sweet and loving. She's already a part of our family, and we love her. Every evening we have cuddle time, we sit cheek to cheek and sing and talk with each other! Your support before, during and after purchase is amazing! You always find the time to answer all my questions. I would never hesitate to recommend you to others! "I love Whimsical Wings Aviary! 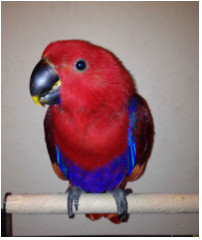 I got Bella, my Eclectus, from Whimsical Wings in December 2013. She was (and is) very healthy, sweet and loving. It was obvious she had been raised with love and great care. I was new to Eclectus parrots and I had a lot of questions. Karen answered all of my questions before I took Bella home, all of my questions that I asked after we took her home and continues to answer my questions as they come up. She has done everything she could to make sure that we have had a successful relationship with our Bella. I highly recommend Whimsical Wings Aviary. I can't imagine getting an Eclectus parrot anywhere else." 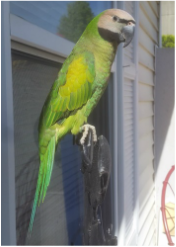 "I got my Indian Ringneck, Darwin, from Whimsical Wings Aviary in July of 2014! From the minute I arrived to pick him up, I knew he had been raised with lots of love and care! Even though I had never owned an Indian Ringneck before, I left feeling very informed and confident. This was all thanks to Karen and her knowledge of the birds she raises. My little guy is honestly the best bird I've ever owned! He is so full of life and is quite the little comedian! He will step up for anyone, try any food you give him, and doesn't have any issues with cage aggression. He has already picked up on a couple tricks, and is beginning to talk! He's such a sweet and gentle bird, and he has an immense love for being around people. I highly recommend getting your next feathered child from Whimsical Wings Aviary. Karen's birds are obviously raised with love and care, and it shows!" "We had bought a mustache parakeet from you last July and I just wanted to say thank you for such an amazing bird!! She is talking up a storm, says well over 30 words and is learning new ones every day!! She has picked up my laugh and laughs all the time. She's spoiled rotten! " "Thanks again for blessing our family with our sweetheart Doris. She is such a loving gentle lady. Loves to chat and give lots of kisses. I can't believe she will be two this spring!"